Versatile scraper tractors have been designed to enhance profitability by outworking the competition. Using high quality components, Versatile scraper tractors focus on power, durability and reliability - because downtime is not an option. Engineered to be heavy duty, Versatile scraper tractors feature Cummins engines and industry proven transmissions. Comfortable for long working days, the Versatile 435SS and 485SS scraper tractors are designed to pull more than just pans, and are a valuable tool for any job site. Versatile tractors have been powered by Cummins engines for more than 40 years and today Cummins is the exclusive engine supplier across the entire line of products. Versatile engineers work closely with Cummins engineers to ensure the seamless integration of the engine with the tractor control systems. 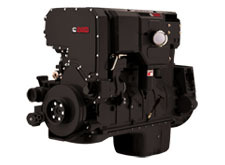 The 15-liter six-cylinder Cummins engine is turbo charged and aftercooled for clean-burning fuel efficiency. The high-pressure injection system with electronic engine control quickly responds to load conditions and throttle adjustments, with a 35% torque rise at 1400 rpm and a 7% power bulge at 1800 rpm to meet the rigors demands of the job site. The large 15-liter engine gives you the most displacement in its horsepower class - guaranteeing you have power when you need it. The cooling system on Versatile scraper tractors uses a large grille and radiator to provide better air flow. The larger surface area reduces the air velocity required for engine cooling, which results in more efficient fan horsepower consumption. 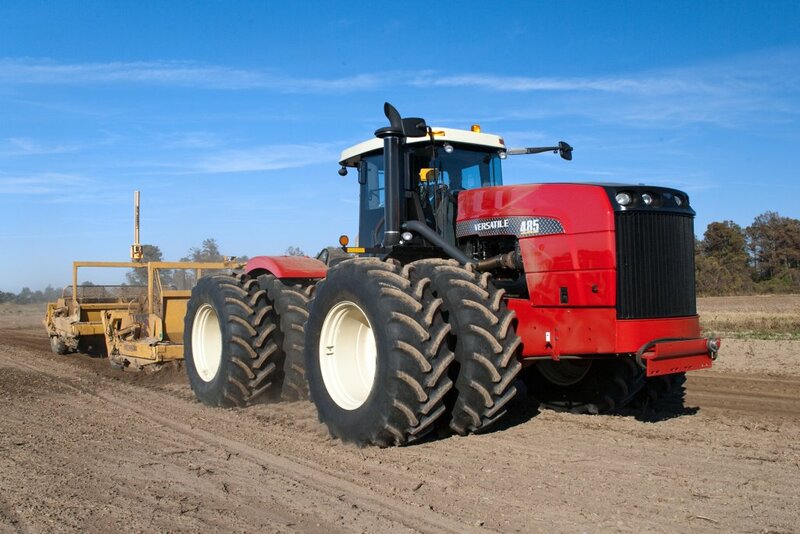 Versatile scraper tractors use industry proven 16-speed powershift transmissions. An industry proven powershift transmission with 16 forward speeds and four reverse speeds, with eight gears in the heart of the critical working range. 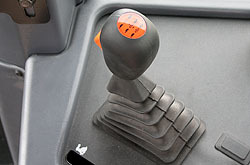 Single lever control provides clutchless shifting from forward to neutral to reverse for all speeds. Powershift gear selection features are designed for simple gear selection, smooth operation and on-the-job convenience. Engine and ground speed consistency is very important for maximizing the efficiency of your equipment. Auto-Shift is included on all Versatile scraper tractors to maintain ground velocity or engine speed for peak horse power and torque. Versatile scraper tractors now have road speeds of up to 25 mph so moving equipment to the next job site takes less time. Optional on the 435SS and 485SS scraper tractor is an auto greasing system. This system is located on the left side of the tractor near the articulation point. This electronically controlled unit can be set to grease in ½ hour intervals from .5 to 5.0 hours. 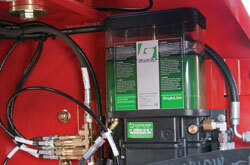 The auto-greasing systems reduces maintenance time. The ability to grease during operation results in the best possible grease distribution across the bearing surface; this results in reduce component wear for moving parts and creates an effective barrier against moisture and dirt. 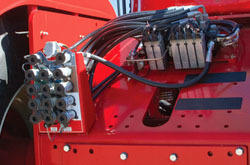 The automatic greasing systems reduces downtime and maintenance costs. The rigorous demands of scraper work require a reliable hydraulic system. The Versatile scraper tractor is available with four or six hydraulic circuits and the choice of standard flow (55 gpm) or high flow (80 gpm). Electro-hydraulics are ergonomically designed for both comfort and convenience and allow for finger-tip operation of hydraulic functions. 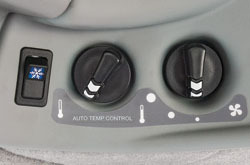 Easily adjustable flow control knobs for the hydraulic circuits are located on the side console. Rotate the knobs to increase or decrease flow to each of the hydraulic circuits without leaving the cab. 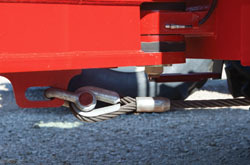 As standard equipment a tightly braided steel tow cable is securely mounted just behind the articulation point and extends all the way to the front weight kit. Simply unbolt the cable from the weights, attach to another machine and get out of any situation with ease. 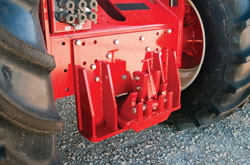 Versatile scraper tractors have a variety of available hitch options to match industry standard pans. Tractors can be ordered from factory with Miskin, Reynolds and K-Tec hitches. For low-light working conditions, Versatile scraper tractors are equipped with fourteen standard worklights mounted on the grille, front fenders, rear fenders and cab. To maximize visibility an optional HID lighting package is available. These lights provide up to ten times more light than conventional headlights. 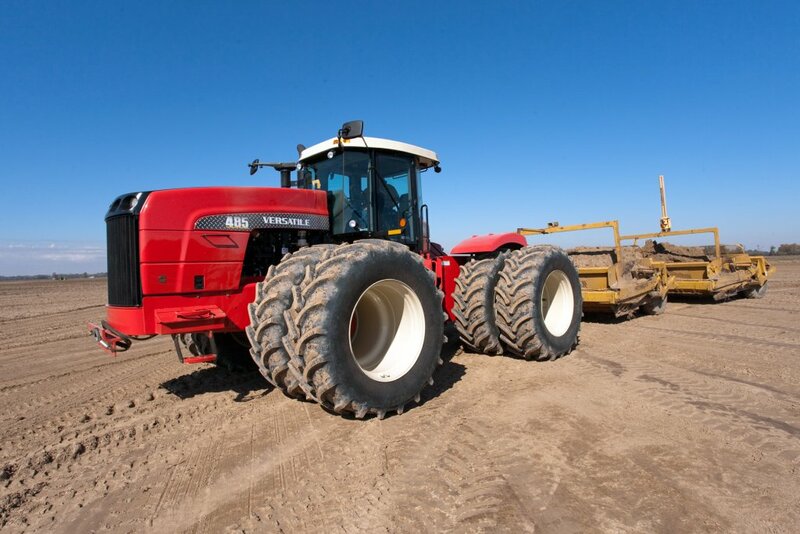 The frames on Versatile scraper tractors are among the heaviest in the industry, designed to manage horsepower and torque without the risk of frame damage. The frame is manufactured from thick high-grade steel plate to ensure structural integrity even under extreme conditions. 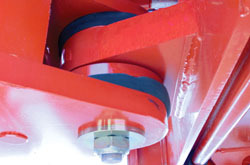 The main bearing at the articulation point is oversized to enhance reliability. The drawbar pull point is immediately behind the articulation point which provides maximum pulling power when making tight turns. The flexibility provided by the subframe and drag link assembly permits up to 15° of oscillation on each side (30° total) as the tractor moves over uneven terrain. Large 3.5" (89 mm) steering cylinders articulate the tractor smoothly and quickly. A maximum articulation angle of 42° means a tight turnaround radius of less than 16' (4.9 m). Two fuel tanks provide a total capacity of 350 U.S. gallons (1325 L). The two fuel tanks are connected with a crossover tube for convenient refueling on either side of the tractor. The tanks are located near the center of the tractor to maintain the front-to-rear weight distribution. As the fuel level drops, the front-to-rear weight ratio remains the same so weight distribution is not affected, regardless of fuel level. 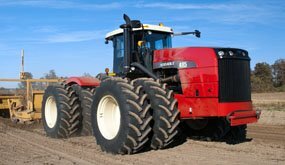 All models feature a large, reliable heavy-duty planetary final drive to provide long service with heavily ballasted tractors and big implements. Large bearings support the planetary hubs on the axle housings. They are built with large axle tubes and planetaries capable of standing up to heavy weights and capable of handling increased bending loads associated with wide dual or triple wheel options. Outboard planetary axles deliver all available horsepower through a large, precision machined floating sun gear. The planetary hubs are suspended on large diameter bearings mounted directly to the axle tubes. The load is supported by the axle housing assembly and not by the drive train components. All Versatile scraper tractors feature reliable final drives that deliver horsepower where it counts; at the drawbar. The planetary axles remain on the tractor during routine maintenance, limiting downtime. Daily inspections are easy with a quick visual check of the axle oil level indicators. 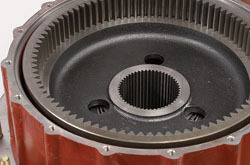 The gears can also be reversed to extend the wear life. The cab has been designed to meet the demands of the job site, offering unparalleled operator comfort and convenience. The access steps are recessed in the fuel tank and the handrails and door handle are functional and easy to reach. The wider cab offers excellent 360º visibility for work and maneuvering large modern implements and there is a clear sightline to the drawbar when attaching equipment. The high-resolution electronic display is easy to read and provides operating data at a glance and the side console features a convenient fingertip-control throttle. 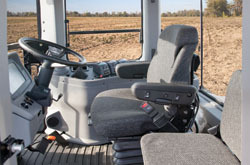 The Deluxe Cab features a heated, semi-active air-ride suspension seat as well as a secondary training seat. Front and rear sun visors are included and electronic automatic climate control will maintain the desired cab temperature. Power-adjustable heated external mirrors, front and rear wipers and washers and a monitor-mounting bracket with power outlets complete the Deluxe Cab package. 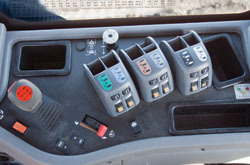 Large controls for the heat and air conditioning are conveniently located to easily manage the cab environment. Plenty of storage space is provided behind and beside the seat for lunch coolers and toolboxes. The result is enhanced comfort to make the long day seem short. An AM / FM / CD stereo with two speakers is optional. An upgrade package adds two speakers and satellite radio (subscriptions fees may apply). The information center, located on the center console, features large digital gauges. The most important information is prominently displayed and easy to understand with just a glance. Coolant temperature, oil pressure, fuel level and battery meter are all indicated on bar-graph gauges. The console is designed to minimize glare, while being well-lit for night time operation. 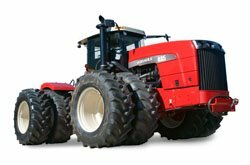 To closely monitor the performance of the tractor and implement, the tractor performance monitor is located in the lower-right corner of the information center and provides information on actual ground speed and slip percentage. Convenient and simple to you use temperature controls keep the cab comfortable during long working days. Optional electronic automatic climate control maintains the desired cab temperature. There are never enough hours in the day and every minute counts. That’s why all Versatile scraper tractors are designed with easy serviceability in mind. 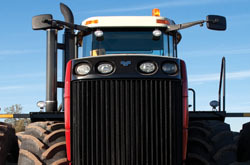 Routine service can extend the life of your tractor, minimize downtime and lower your operating costs. Daily maintenance is made effortless with side shields that open up and out of the way to allow access to fill points and dipsticks. Fluid checks are easy with conveniently located sight gauges. A swing-out assembly on the front grille and radiator expose the hydraulic and transmission oil coolers, air conditioning condenser, fuel cooler, and charge air cooler for fast cleaning. The Versatile outboard planetary axle system is known for its ease of service. 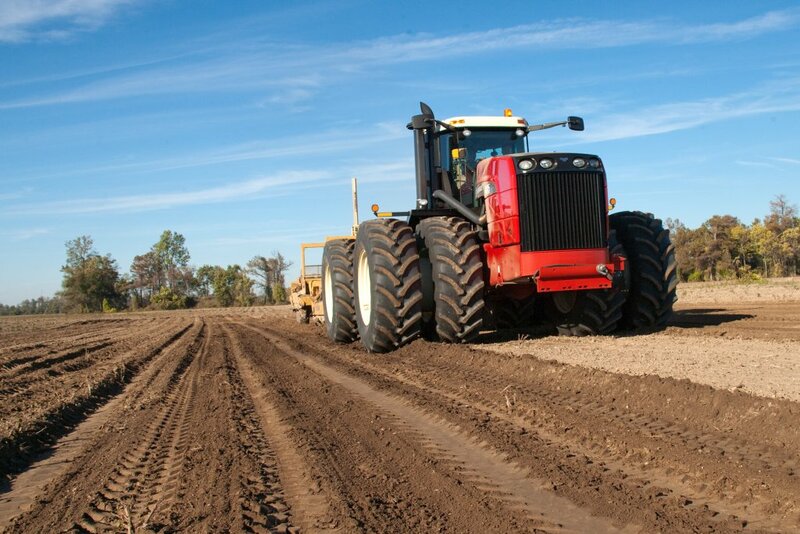 Planetary axle covers can be removed from the tractor without removing the axles and tires, limiting the amount of time needed for routine maintenance. Daily inspections are easy with a quick visual check of the axle oil level sight gauges. Refueling can easily be accomplished from either side of the tractor. A crossover tube allows both tanks to be filled quickly and with a capacity of 350 U.S. gallons (1325 L) you’ll have many hours on the job site before stopping for fuel.